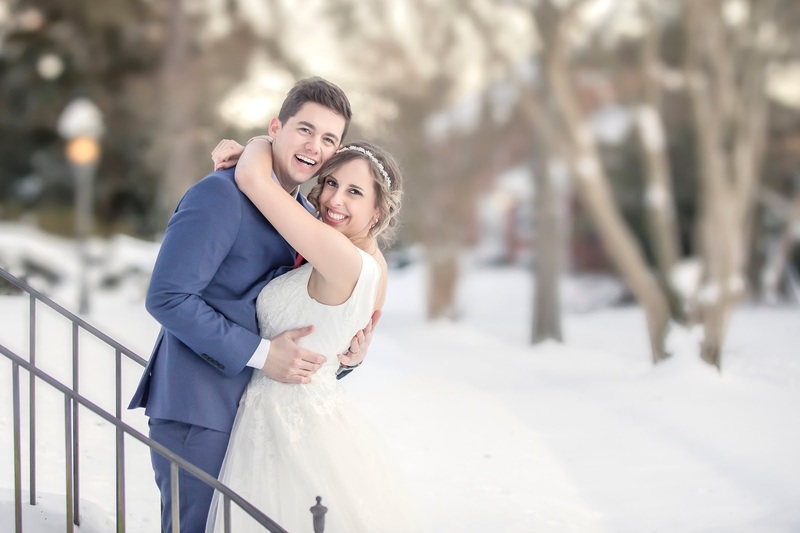 Christi and Adam Giedd's Blizzard Wedding! 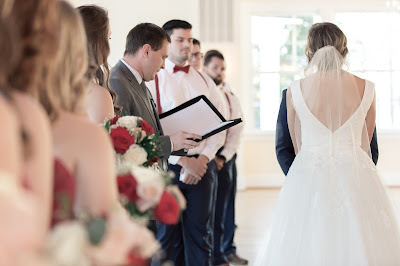 On January 5th 2018, my only daughter got married. Of course this was one of the most important days of her life, but as I had spent the previous five months in a haze of wedding planning—respectful to the wishes of the bride and groom of course—it was one of the most important days of my life too. 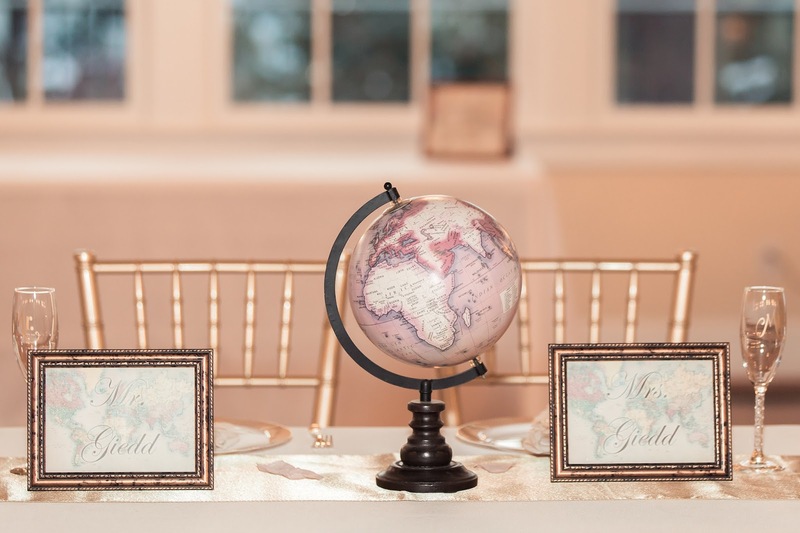 And although both my daughter and I were determined to keep the wedding—and the cost—in perspective, we had gone to great lengths to make the day special for the bride and groom, as well as all the guests. Burgundy and blush with navy and gold accents, vintage travel theme, classic roses, an idyllic old Southern home as the venue. 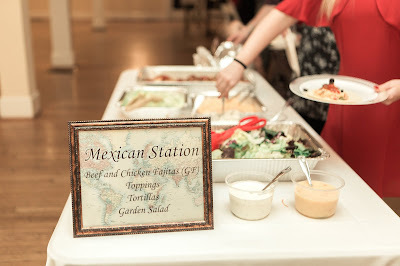 Much time and love had gone into each step of the process, from handmade centerpieces and 40 hand-ironed tablecloths, to unique country themed decorations for each table, to a beautiful binder full of packing lists, schedules, and layout plans. 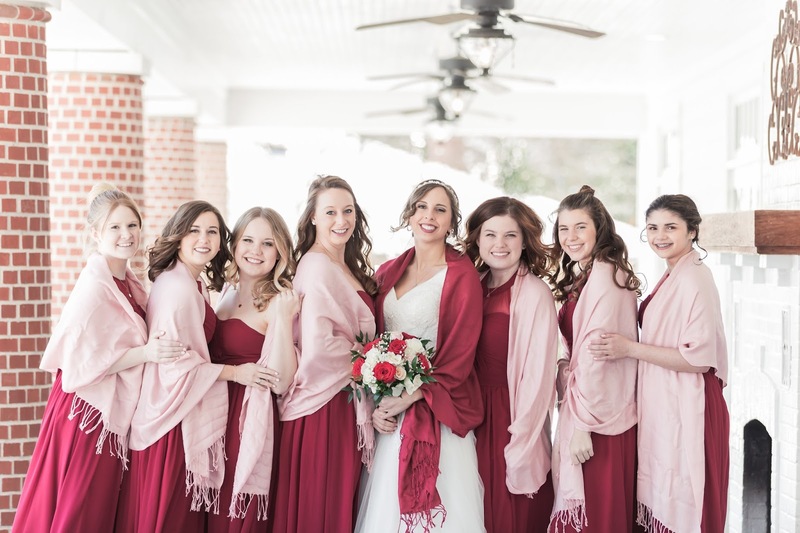 Bridesmaids on the porch in their burgundy and blush. We had hoped for a beautiful 70 degree Virginia winter day, or at least 50 degrees and sunny so we could use the huge, graceful porch on the century-old home we had rented while we rearranged the ballroom between the ceremony and reception. And instead we got…Virginia Beach’s only blizzard on record. 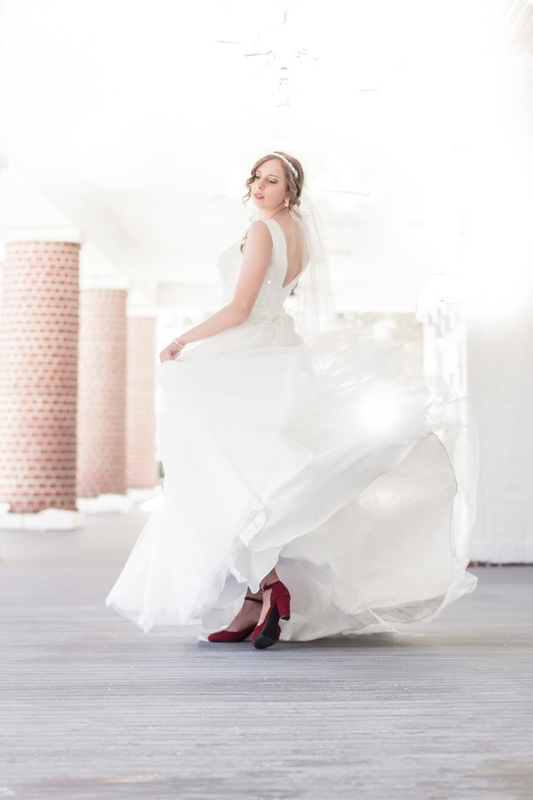 I love this shot of Christi! Check out the shoes. I. Kid. You. Not. For a few hours the day before, we seriously wondered if there would be a wedding or if all our dreams of the last five months would go up in a puff of SNOW! And although the storm added its own sense of stress and confusion, in the end, it added so much beauty to our day as well. 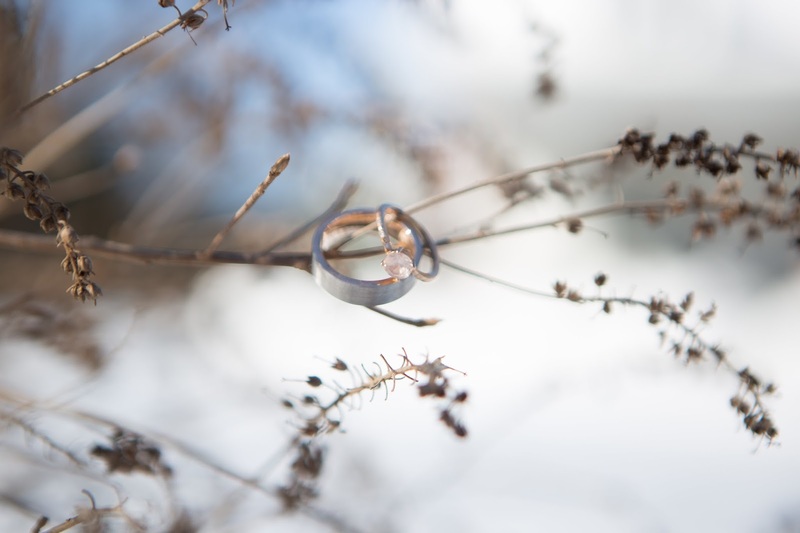 Wedding rings in the snow. As we approached the day and realized facing winter storm Grayson was inevitable, we kept up our faith. The worst of the snow would be finished a good 24 hours before the wedding, and the reporters were calling for about 3 to 5 inches. That should give some time for the major roads to be cleared. Plus we were praying hard, and we picked up all our rentals a day early. No point in listening to that extreme model hinting there could be up to two feet of snow, right? Everything would be fine. 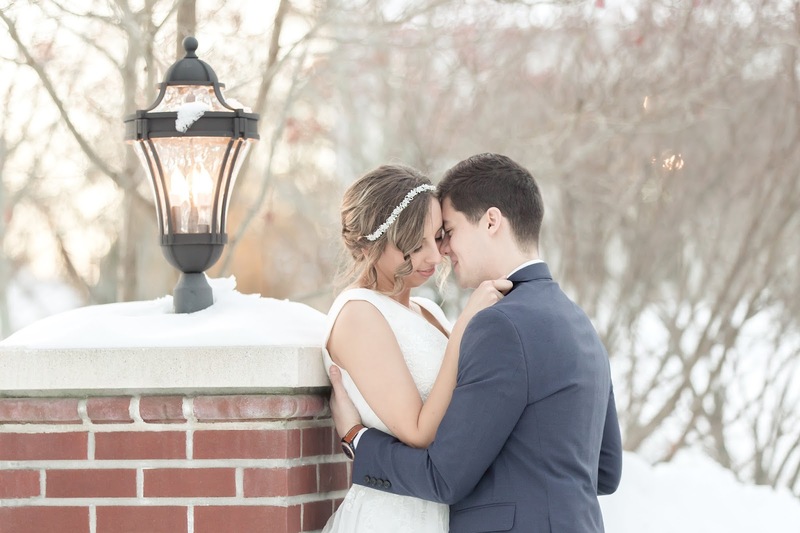 Snow can't stop true love. Nonetheless, plans shifted and we kept all the bridesmaids and groomsmen who had arrived in town at our house to be on the safe side. The next morning when we saw the thick blanket of white covering the ground, we realized plans for the outdoor bachelor party might need to change. When flights started getting canceled, we got resourceful and began looking for alternate routes to get people to Virginia Beach. Snow shoes - too cute. We made sure our venue would even be open, and good news, it was! 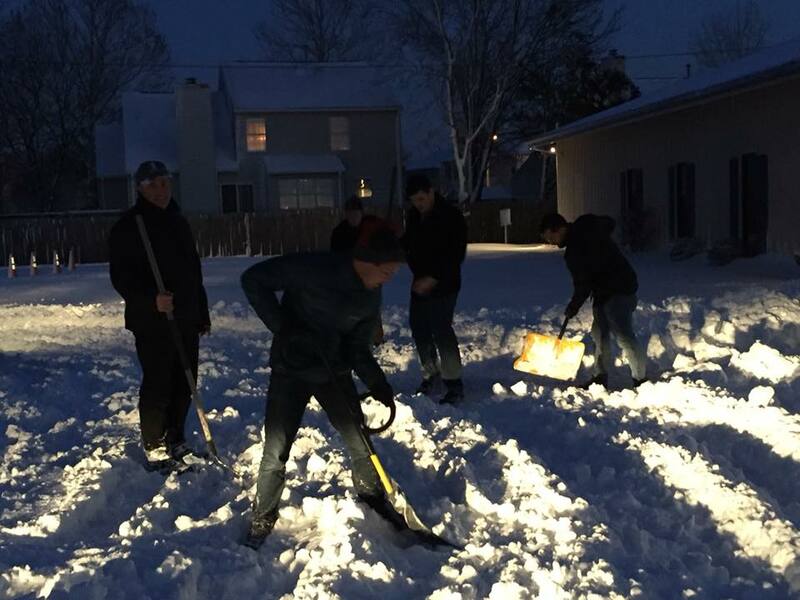 They had access to a generator if the power went out, and would plow and shovel the surrounding area. But then…my husband couldn’t get the van out of the neighborhood. And my friend with a big truck got stuck in his cul-de-sac, and my brother-in-law with one of the canceled flights got stuck on a major highway en route from D.C. And I started to crack. I almost cracked, but Christi and Adam are cracking up. By that time we knew there had been at least eighteen inches of snow in our southern city that could be crippled by two. We only have a handful of snow plows for the whole area. They start with the highways, then the major city streets, and then…wait around for the rest to melt. My husband and I decided our only hope was to find friends with four wheel drive vehicles, so we called a different brother-in-law with a Jeep to pick up the stranded one, and my husband continued making calls. But by this time, we could only hope against hope that somehow a wedding would still happen the next day. 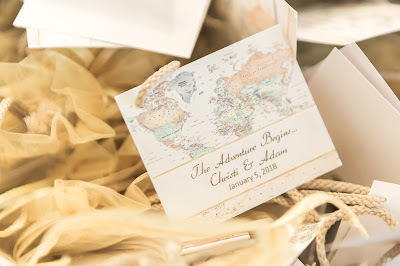 Our wedding slogan, "The Adventure Begins," took on a whole new meaning. No joke, the slogan of the wedding, "The Adventure Begins..."
As I mentioned, I was starting to crack. I had been hiding in my room for a while. But as I did my daily devotions, I was directed to Revelation 21:2, "And I saw the holy city, the new Jerusalem, coming down from God out of heaven like a bride beautifully dressed for her husband." It brought to mind all of the scriptures about brides and bridegrooms and wedding celebrations, and reminded me that God cares about weddings too. My daughter seemed to be doing a bit better than me. She’d be getting married, somehow, even if by skype, the next day no matter what. The blissful bride and adoring groom. But honestly, I was the one who had poured so much time and money into the occasion, and had thought through every detail backwards, forwards, and upside down. Finally, although my friend who was supposed to help me with the flowers couldn’t get to me, I started working on them nonetheless. I figured wedding or not, they’d be dying in a few days, so I might as well put them into bouquets. 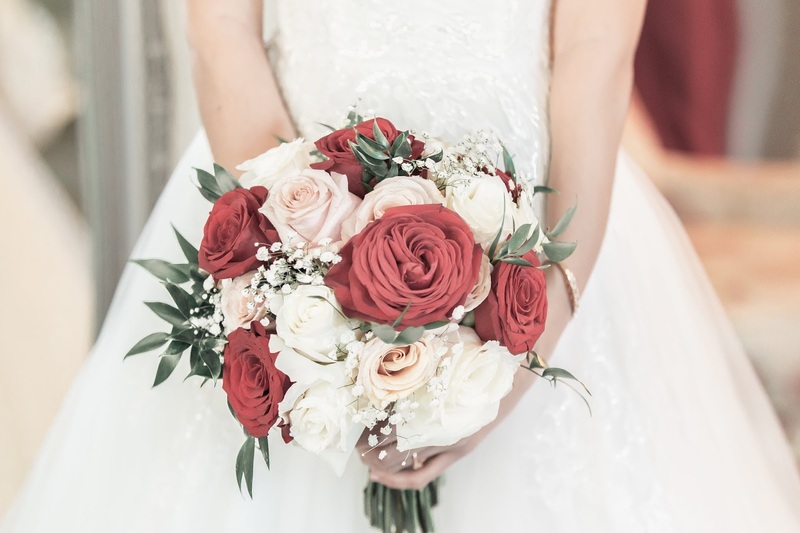 Those bouquets got some use after all! 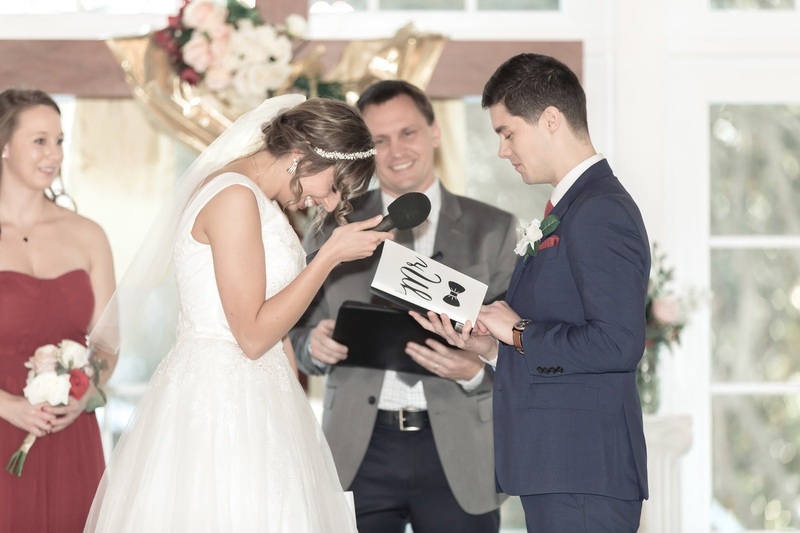 Boy was I wishing I’d spent $100 for wedding insurance at that moment. I felt sick. Almost like a death. The death of a dream, I suppose. What about all the prayers? Where had we gone wrong? Didn’t God care? I kept trying to cling to the scripture passage I’d read that morning. More flowers. Good thing we made them. My hands were shaking so hard that I couldn’t do much, but I started sorting and prepping the flowers. Before long, the bridesmaids joined in, and one even had some experience with floral arranging. It gave me something to do, something positive, something hopeful. The brother-in-laws finally made it to our house safely, and we decided to send the Jeep to scope out our church, which was the rehearsal and rehearsal dinner site. The snow-covered Woman's Club of Portsmouth made an idyllic backdrop. But then came back another dim report. The guys couldn’t get into the church driveway. Between the length of the driveway, and the giant pile of snow made by a snowplow blocking the entrance to said driveway, there was no hope. 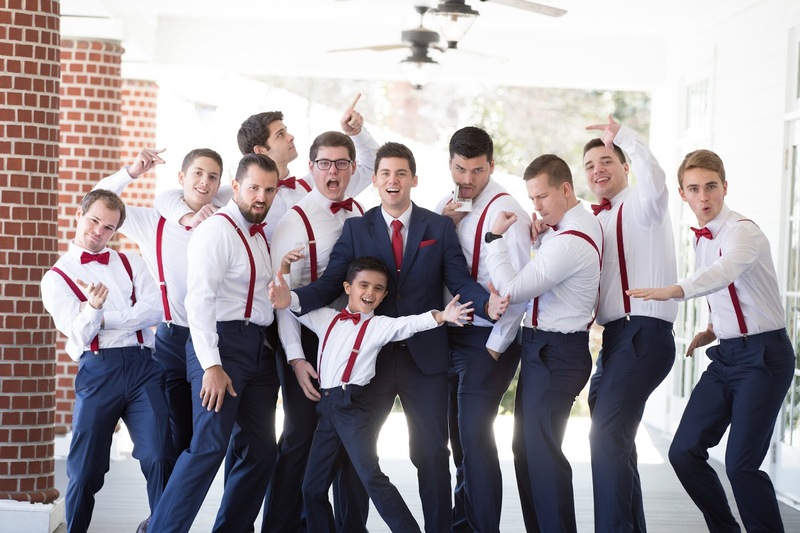 Groomsmen and father of the bride hard at work. That might have been our lowest point. Even my positive, perky daughter began to show the wear and tear. 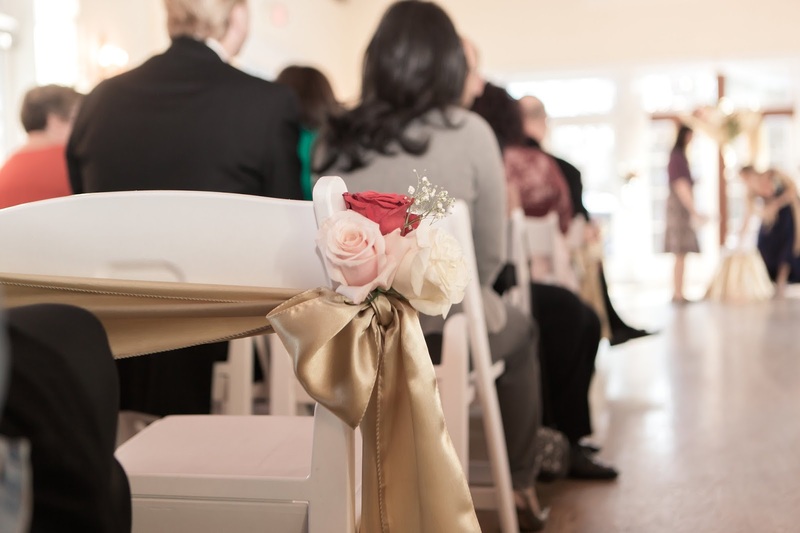 If we couldn’t manage a rehearsal dinner, how could we possibly expect a wedding the next day? It finally hit my husband that we’d missed our window to cancel the rehearsal food, and due to our decision to press forward the new in-laws would be losing money. Then, at that lowest point, a neighbor we hardly knew knocked on the door. The groomsmen thawed out nicely and had a great wedding day. Happy couple in the snow. That’s when the tide turned and a flood of community really began to surround as. Groomsmen and friends dug us into the church. A caravan of four wheel drive vehicles shuttled us to the rehearsal dinner. The owner of the restaurant we had ordered food from cooked our dinner himself since his workers couldn’t make it in. My friend finally arrived at my house and constructed the most gorgeous bridal bouquet, and the wedding went on! The next morning we were just so thankful to be having a wedding at all, there was absolutely no sweating of the small stuff. The caterer had no workers, couldn’t fit the silver chafing dishes, and needed picked up by our 4wd caravan, but he made it with all the food! We were ecstatic! No hair dresser, no problem. We’ll do it ourselves! The photographer has no assistant and needs a ride. We’ve got this! Forget the fourteen foot ladder, we’ll find something lower to hang fabric from. 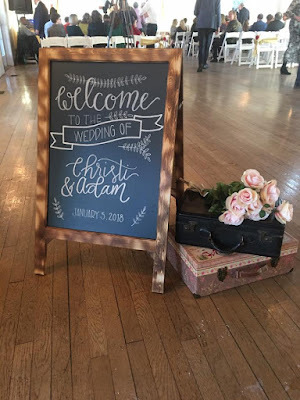 And in a happy final turn of events, friends somehow managed to get the seven-foot-cross to the venue, creating a stunning centerpiece for the ceremony. 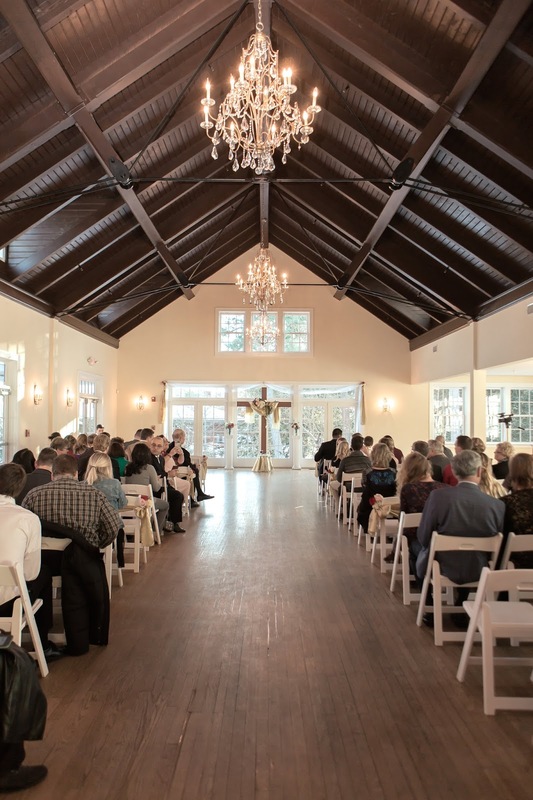 The cross made a stunning and fitting centerpiece for the ceremony. 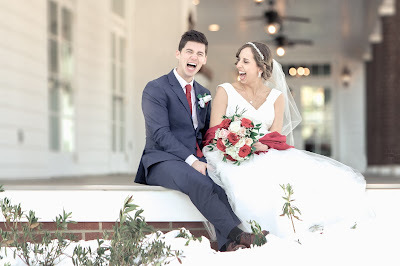 My sister and sister-in-law, who had offered to help me with the wedding, went above beyond and were true rock stars in the midst of our post-blizzard storm. My pastor and his wife were amazing too, there to help, support, and encourage us all the way. And due to the unexpected snow, the groom’s parents and a few other friends ended up at the venue early and helped out as well. In fact, everyone, I mean everyone, pitched in. Pastor Bill Heffelfinger of Acts 2 Church not only officiated, but might have helped with tablecloths too. Yes, there was extra confusion with all the planning just to get people and supplies to the venue. But we were so much more grateful for each element that went right and amazed by how lovely everything turned out, falling into place just in the nick of time. In the end, we were missing two bridesmaids, two grandparents, and about a third of the guests. 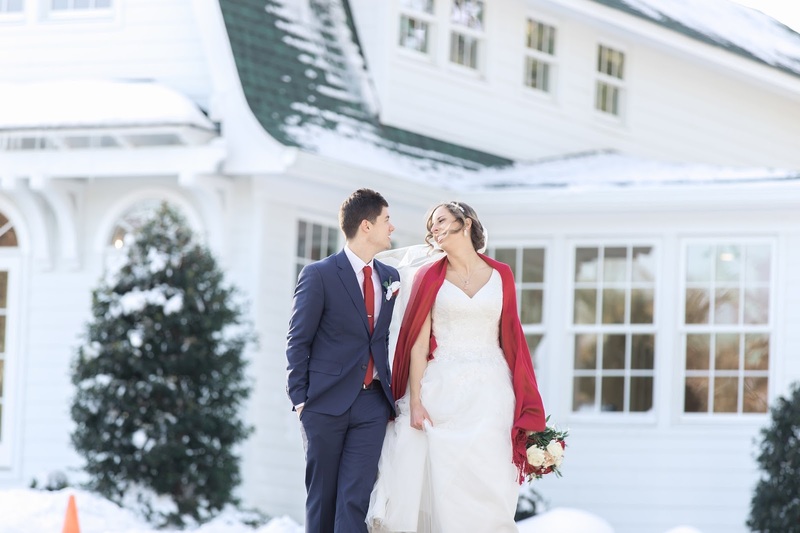 But we were so truly blessed and honored by each and every person who braved the snow to join us that day, and blissfully shocked as a surprising number of out of town guests drove in despite everything. We felt so surrounded by love, a feeling I’ll never forget. 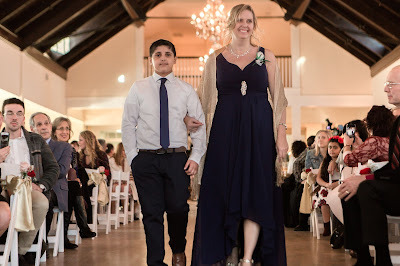 Mother of the bride, Dina Sleiman, accompanied by nephew Luke. The ceremony was beautiful. The message inspiring. The vows funny and touching. People felt blessed just watching such joyful expression. 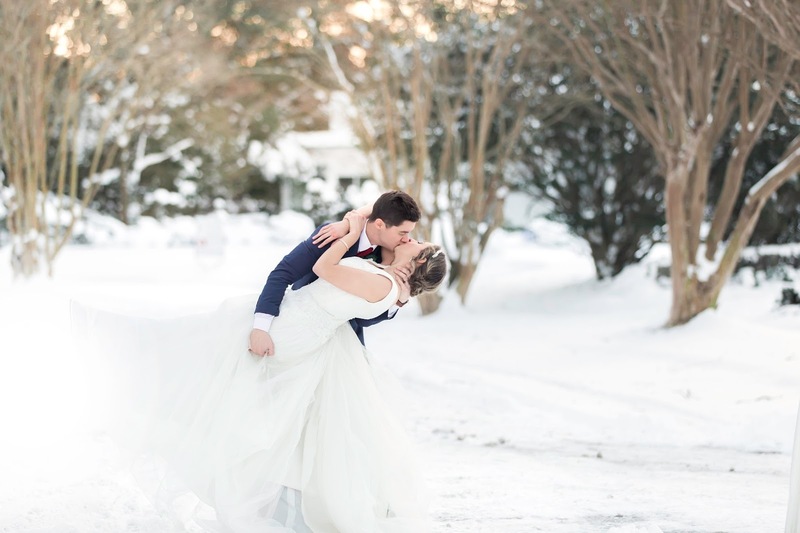 The snow couldn’t stop true love! Welcome to the wedding of Christi & Adam! We made it! And our historic winter storm brought delightful surprises as well. 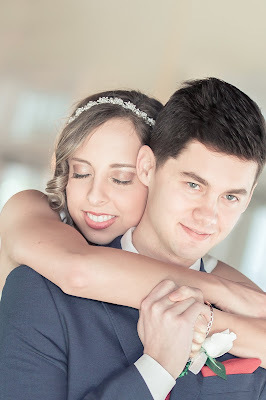 Starting with the most gorgeous wedding pictures ever, as I hope you’ll agree. We’ll have those treasured photos for the rest of our lives. And after the ceremony, our community surrounded us again, helping with the food to give the lone caterer a hand. That neighbor we hardly knew…he had served in our caravan for two days, and we were thrilled that he brought his wife and daughter to join in the party. My own daughter welcomed all crashers on Facebook, and in a fun twist, a number of friends we couldn’t have fit on our normal guest list took us up on the offer. 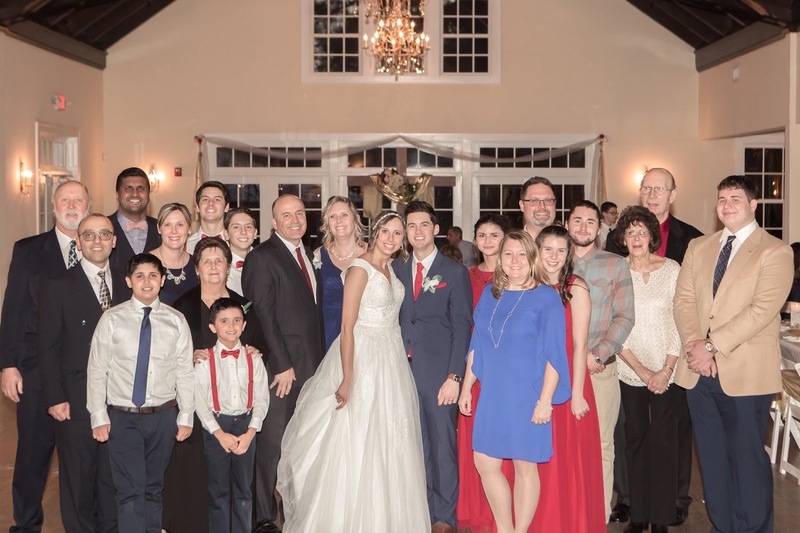 Christi Sleiman's side of the family. 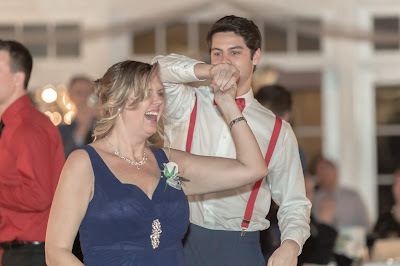 After all that, I found the best part of the whole wedding for me was shaking off the stress and planning and organizing of the day and dancing with friends and family, freely and with abandon at the end of my roller coaster experience. I had hardly given a thought to the dancing other than checking if my daughter had made a play list and handed it over to the sound person. And there it was, the best part of my day. Dina Sleiman dancing with son Jonny. But beyond all of that, there was a quieter beauty too. The beauty in discovering that although God had not done this wedding thing our way, He had by no means forgotten us. 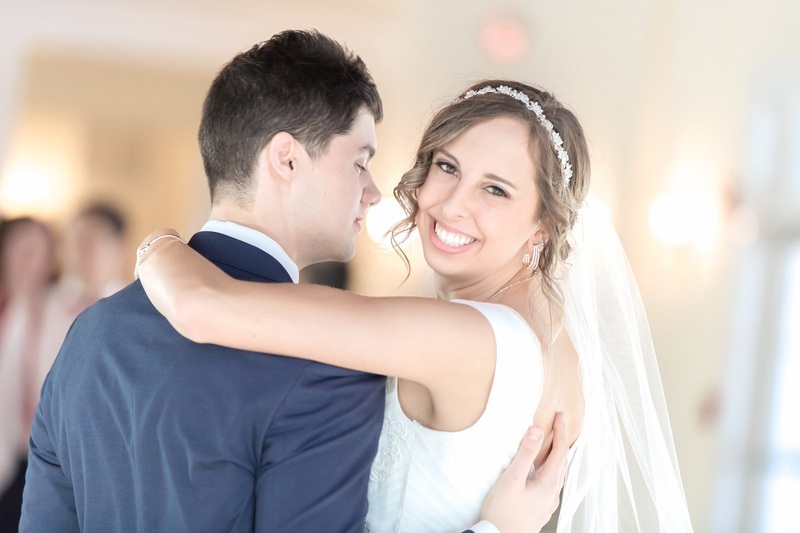 Like a bridegroom for His bride, He had been there with us, providing, supporting, and loving us every step of the way. A bridegroom's love for his beautiful bride. Visit Perspective Photography for more of Christi and Adam's wedding pictures. Dina Sleiman writes stories of passion and grace. 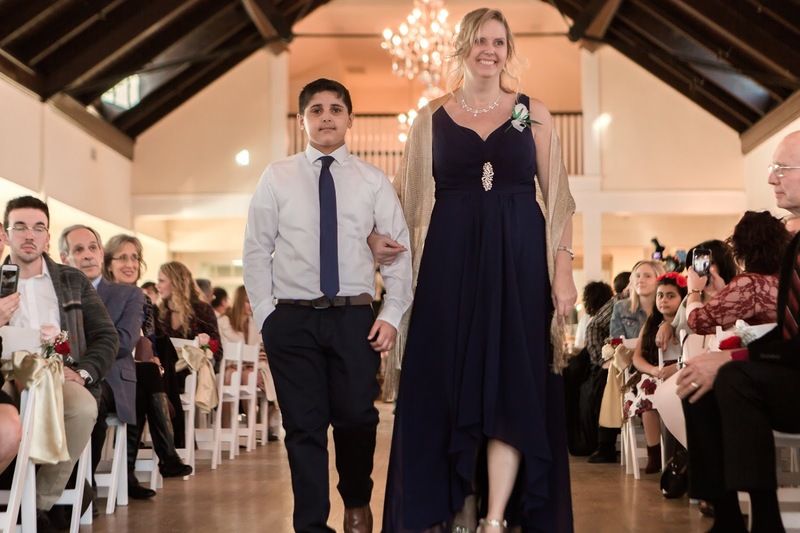 By day this wife and mother of three nearly grown children utilizes her writing gifts with worldwide humanitarian organization Operation Blessing. She won the Carol Award from the American Christian Fiction Writers in 2016 for her cross-over YA novel, Dauntless. Check out Dina's many titles on Amazon or visit her website http://dinasleiman.com for more info. I enjoyed the whole process as you prepared and then thought OH NO as the forecast came along. But what an extremely UNFORGETTABLE wedding and reception for everyone. The photographer probably had a blast doing it! Congratulations to all! I'm so happy for Christi and her groom and your families. God bless them! Oh, the photographer was like a kid in a candy shop! She's a friend of mine from work, and she's amazing. Thank you for your well wishes. Wow! That was just beautiful! You have me crying! God works things out! It reminded me of my daughter ‘s wedding. The church was difficult to get to if you didn’t know the area. The florist was a friend of my daughter’s and she got lost and never made it to the wedding. Rachel couldn’t even call her because her cell and the number were in her future in laws motel room. I have a picture of her panicked face when she learns the news! My sister came to the resue and looked up at the shelf around the basement kitchen of the church and low and behold there were beautiful artificial arrangements. She started picking single red roses and handed them to the bridesmaids and made a quick bouquet for Rachel! Our pastor told Rachel she could keep them as a memento. Now we can laugh. But remember the beautiful ceremony. Thanks for sharing your experience, Paula. I can imagine the feeling! Thank God for resourceful sisters. I'm sure if it hadn't snowed, something else would have gone wrong. LOL. Every wedding has a story. My mom mentioned her furnace dying on facebook, which reminded me that another small miracle was that we never lost power at our house, which would have been bad since we had like 14 or 15 people there.